The long, sizzling summer is almost fading away and, it's about time to welcome the new season. What's welcomed is not just the new autumn, it's your appetite which has been missing during the hot season. 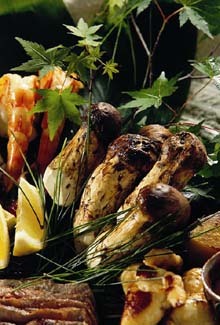 How about bringing it back with a special set of "Pine Mushroom" dishes at a Japanese super dining restaurant? Highly nutritious pine mushroom, the ideal choice of autumn delicacy good when fresh or cooked, is fully served at Novotel Ambassador Gangnam in various forms including salad, BBQ, steamed and fried ones. The course menu features two types, 80,000won and 150,000 won, which include pine mushroom salad, assorted sashimi and various pine mushroom delicacies for your health. Book your table now and welcome new season with the fine taste of pine mushroom.